The 5.25” device bay has been a long standard in computer history. It started from the 90s legacy industrial PC cases all the way to today’s Micro ATX cases. 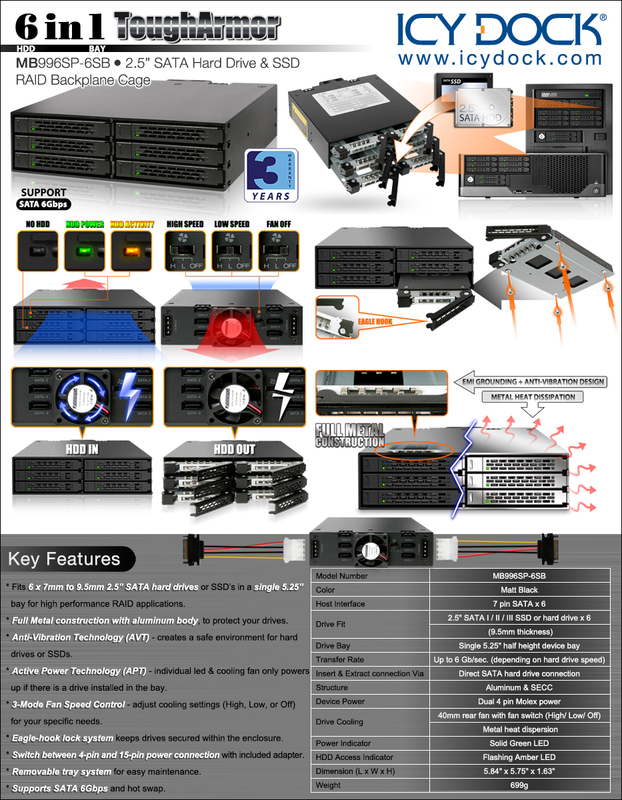 The 5.25” bay has been widely used for optical drives such as DVD and Blue-ray, or with even a single 3.5” hard drive with mobile rack. However, it is almost impossible to use a single 5.25” bay to create complex RAID storage until the MB996SP-6SB Full Metal 6 x 2.5” SATA Hard Drive & SSD Backplane. This is a device commercially designed for: Medical & Military systems, Media servers, IPCs, HTPC, and All-In-One computers, approved & used by Tier 1 companies.